Providing hand-crafted investment and retirement solutions, CochranMickels is a team of fiduciaries working in your absolute best interest - without exception. Free from outside influence or third-party restrictions, our firm will design your plan and manage your portfolio in honor of you, and in consideration of your best interests. Working in a team environment, we bring years of combined industry experience and talent to tailor a plan suited exclusively for you. Utilizing Monte Carlo Scenarios, we believe that the best laid financial plans consider all aspects of an individual and his or her life. As fee-based fiduciary Advisors, CochranMickels Retirement Specialists exists to serve our clients in an independent fashion, solution-oriented way. Focused on the distribution phase of a client’s wealth, we provide unique financial solutions to individuals as they approach and venture through retirement. Working in Your Best Interest: As fiduciaries, our main objective is your success - not ours. We work tirelessly and with a purpose to enact custom planning solutions aimed directly at the achievement of your goals. Instilling Transparency: Partnering with our firm means absolute transparency and an open line of communication at all times. We will always make sure you understand what we do, how we get paid, and the exact purpose of our fees. Offering Clarity: Our firm utilizes the latest industry technology so that you will be able to see your plan come together online, and monitor it in real-time. Building Relationships: CochranMickels isn’t interested in adding to our numbers - we are interested in adding to our family. When you collaborate with our team on your financial future, we will work to earn your trust and build a relationship that will last a lifetime. 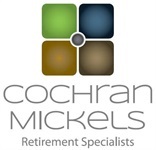 When you are ready to take hold of your future and turn your dream retirement into reality, lean on the trusted advice and expertise of Cochran Mickels Retirement Specialists. Book a free consultation now.